La Rioja is a fun place to eat. Any place where wine is so fundamental to a location’s identity will result in a culture of food that accompany their wine. And although, I believe that a food culture is prevalent worldwide, ranging from spicy to bland and rich to light; but if I had to sum up Spain‘s food culture, or specifically that of La Rioja, in one word, that would be: ingredients. As my friend Burt likes to quote the late Julia Child, he reminds me that when asked about Italian cooking, she stated “That’s not cooking, that’s grocery shopping!” I believe the same can be said for Spain. White and shiny when raw, and more often found tinned, the Spanish love this stuff. Usually, if not always, the asparagus is cooked until mushy and then served with mayonnaise and it is a food that took me awhile to fall in love with. I grew up in a culture that cooked its vegetables until slightly crisp, where a bite would yield a loud snap. But it’s not to say that I can’t learn to appreciate other styles. 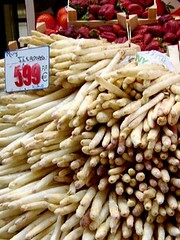 When at their best, white asparagus can show a subtle sweetness that is both delicate and light. If you visit, remember that unlike many parts of the world, these vegetables can be incredible when served right out of the expensive jar or tin. I would suggest that you buy a few to bring home from any one of the many wine shops of Logrono or elsewhere in Spain. You see canning in this part of Spain is considered an art form and the quality shows. No need to really explain, but this is a required ingredient on anyone’s shopping list. Everywhere you go in Spain, you will be confronted with different variations on this treat, from 1 euro sticks at the grocery to 100 euro/kilo Iberico slices at the market. As a lover of “hot” food, meaning spicy, La Rioja is one of the only places Spain that you’ll find it. Spain, generally, just doesn’t do “hot”, and I know many a Spaniard who would cringe if I told them about the hot sauces I have collected in the past. 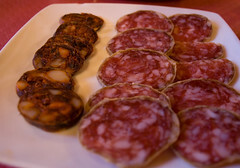 But La Rioja’s spicy chorizo has a smoky spice that demands, in all honesty, a nice cool beer. Also, while most of Spain tends to nibble on this delicacy alone, the people of La Rioja also use it in their famous Patatas Riojanas – a dish which basically amounts to a potato stew with smoky chorizo at its heart. Suckling baby lamb. You cannot find a restaurant in La Rioja that doesn’t have this on the menu, and if you do, you should get up and leave immediately. This is Rioja. In fact, if you drive down any road, you will see barbecues in backyards or alongside houses everywhere you go. There is only one reason these exist, lamb chops. Sliced to about 1/4 inch thick, and with the full rib attached, they are succulent treasures. When they’re thrown on the grill, grapevine cuttings are added to the fire to give a slight smoky goodness to the meat, and they are finished with only a touch of rock salt over the top. 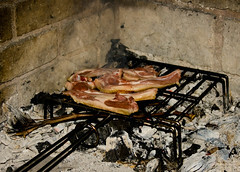 The second variation on Lechal is a roasted version similar to Cochonillo (suckling baby pig), where you slow roast a piece of the lamb in a wood fired oven. Add a touch of water to a ceramic vessel, a dash of salt, and if you want to get fancy, I’ve seen a bay leaf thrown in for good measure. What emerges from the oven is a chunk of lamb sauced in it’s own drippings, with the meat literally falling off the bone. Often you’ll find it sitting on a bed of potatoes with a slice of red pepper. Talk about versatile, this is one food that almost any menu in Rioja will have on the list. If its roasted lamb, red peppers will sit beside it. Bacalao will be stuffed within them or the creative variation of this finds ground lamb within. You may find them on a salad, filled with cheese, on a plate by themselves, and sometimes, pureed and poured over a side of beef. If you don’t see a slice of red pepper on your plate when you order, you may want to reconsider where your eating. Typically, you can expect these Piquillo Peppers to be small and sweet, and they are almost always skinned and cooked before serving. Soft, sweet and lightly smoky Piquillo peppers are a delicacy which after awhile, you tend to crave with every dish laid out in front of you. I know that this post will elicit screams of horror from Spaniards, since I’m stopping at this point with the main ingredients typically found in La Rioja Yes, yes, yes, I know there is so much more to explore, and I encourage all of you to please continue adding to the list of fine traditional ingredients. Just leave a comment, and if possible, a link to any information on those ingredients you wish to mention. 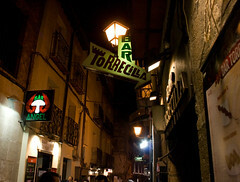 But for now, we going to move on to the most famous street in La Rioja called, Calle del Laurel. A short and unassuming place that during the day, appears as nothing more than a back-alley of Logrono, but at night, is alive and electric. Visit on any weekend and you’ll have trouble squeezing down the road, with whole families (3 generations worth) elbowing each other as they slam down small bites of various tapas. What is the most surprising, or interesting, part of this street is that most places serve only one item, plus a small range of beverages. Put another way, they have one thing that everyone orders, thus leading to the one item menu. I know it’s hard to explain, but it seems to work. 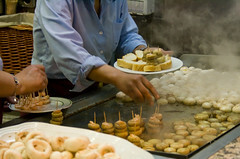 Stop at one restaurant for sauteed mushrooms stacked on a piece of bread and topped with a baby shrimp. 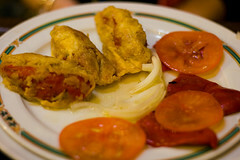 Stop at another place for fried pigs ears, another for pincho moruno – a skewer of marinated meat, grilled briefly and dripping with juices. Order squid or small toasts topped with meat/eggs/veggies, and wash it all down with a corto. Corto is equivalent to a “shot” of beer or wine. Basically, you order one tapa and one “shot”, and then push your way out to the road where you quickly consume the piping hot food followed by a gulp of liquid. I’m failing to do justice to this experience, but all I can suggest is that you take the time to experience it for yourself. What else? Well there are the restaurants of course. We had the good fortune to experience four while visiting the region. Dinastia Vivanco and Marques de Riscal are both higher end affairs with exquisite attention to detail. At Vivanco, you sit in a half moon shaped space with windows overlooking the vineyards. Foods are presented in a modern way, while holding true to local traditions. 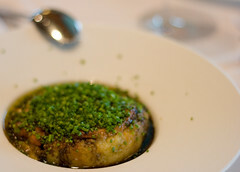 If it’s available, do not miss the couscous and foie appetizer, topped with caramelized balsamic vinegar. This is to die for! As with most places order a variety of tapa’s before moving onto the roasted lamb! 😉 Marques de Riscal has a star, a young chef by the name of José Ramón Piñeiro, who showed us a tasting menu that was both diverse and full of new takes on local ingredients. 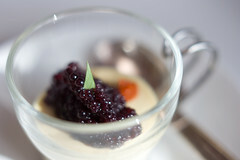 One of our favorites being the “wine caviar” and foie. This little dish is served in a small glass with creamy foie under small beads of gelled wine. The second aspect we liked, was that at the end of the meal, guests of the hotel can retire up to the library to take their coffee, and if they so choose, a cigar with a digestif like Patxaran. Sadly, I did not have time for this, but I am prepared for next time. We also ate at a few Tapas places on Thursday night after a lunch with the girls of Excel wines. Heading to the center of Briones, perched on top of a hill and behind a small door located in one of the many winding streets sits Los Calaos de Briones. I think the reason this place stood out beyond their amazing foods, was their smiles and friendly service – a rarity here in Spain. I recommend them highly if you are looking for something with atmosphere and class. Finally, and really quite surprisingly, the last and most interesting restaurant we visited was one that we would never have gone to if we had not been guided there. La Cañada is a roadside cafe. Unassuming and definitely not on the culinary radar, it is a treasure that all good foodies should make a pilgrimage to. Here’s the part that amazed us. Eleder Ferrer García is the owner, chef, waitperson, barman and more. He built the restaurant with help of his family and friends, in addition to serving, cooking and attending to our meal. We ate here as part of our horse riding adventure, which his brother Oscar was in charge of. You need to visit this place. No really, YOU MUST VISIT THIS PLACE! They make everything themselves from local ingredients, which yields sometimes unexpected and delicious results. Jabali (wild boar) and venison are both created into traditional sausages. Jabali is then thinly sliced, quickly cooked and bathed in a sauce of its own juices, while the venison is prepared in much of the same way but drizzled in a plum sauce. Did I mention that they also hunt their own boar and venison?! Huevo’s Rotos (scrambled eggs) like I’ve never had them before, with a thin thread of vanilla sauce that somehow made the rich chorizo and eggs come alive. This meal was one of the best I’ve experienced, and if you get a chance, La Cañada is a place not to be skipped. An added bonus, if you make the trek up there, are the local beans. We’re not talking Jack and the Beanstalk here, no magic, but rather, small dark beans called Alubias de Anguiano or Caparrones. Eleder was kind enough to make us a small dish of them to try, and I have to say, they were truly special. Oh, and if you want to take some home, you will pay a special price due to their limited production every year. Finally, and though we didn’t try any, there is also a local goat cheese called La Aulaga. I’m seriously mad that we didn’t taste it, but I know we’ll be back! So there is our recap of Rioja food. In truth, I’m leaving a considerable amount out of the discussion, not to mention restaurants, markets, and other ingredients! So, please, if you know of a place to share, leave it in the comments. When our newsletter comes out later next week, we’ll include it, and give you credit for the information. Pass this on to anyone else you think can help out!